Introducing the most versatile plant hanger ever. Free yourself from the tyranny of plastic and wire hanging baskets! Effortlessly transform virtually any lipped pot into a hanging, drip-free planter—no macrame required. The ingenious design securely supports pots from 6” to 12” across. Big pots and little pots. Clay pots and resin pots…yes, even plastic pots. If it has a lip, this hanger will hold it—with simplicity, strength and style. The self-watering reservoir provides a much-needed solution to that awkward dripping pot problem. Easily secured to the bottom center hole of most any pot, water is caught and wicked back up into the plant. Drips are eliminated and watering is reduced—great indoors and out. 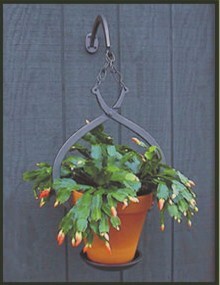 Finally, our graceful cast aluminum hook allows you to suspend your plants from a wall or window frame. Together, it’s the ultimate plant hanging system.